In his first campaign for Presidency in 2008, current re-elected President Barack Obama promised a plan for immigration reform in his first year of office. This promise, like many made by past and present elected officials, was not fulfilled during his first term. The President was re-elected this past November and immigration reform was again part of his platform. While some might be discouraged by the lack of action on this key policy issue by the President and Congress during the past four years, I am cautiously optimistic. Living and working in Washington, DC allows me a unique perspective into this ongoing policy debate, and this only reinforces my optimism. The foundation for true and comprehensive immigration reform was laid in November of 2012. Barack Obama defeated the challenger, Mitt Romney, on the back of a diverse coalition of supporters. The topic of “jobs and the economy” dominated the airwaves during press conferences, rallies, and debates at local, state, and federal levels throughout the election season. While immigration is often thought of as its own area of policy, the simple truth is that it fits into many different policy discussions. In my opinion and from what I have observed around Washington, DC, the immigration debate is a key part of the larger discussion of economic policy. A common refrain among politicians of varying ideologies, in the media and around town, is that the American economy is still in a slow growth pattern and needs to be kick started. Truly comprehensive immigration reform could provide some of that energy, and both of the United States’ main political parties are aiming to harness this potential. The presidential election was decided by narrow margins of victories in swing states and Obama’s overwhelming support among certain demographics, including a significant margin of votes amongst Hispanic voters. Exit polls estimated Hispanics voted 71% to 27% in favor of Obama. Clearly, a key part of Obama’s coalition was Hispanic communities across the country, and they made a significant difference in some of the swing states like Colorado and Virginia. While the priorities of the Hispanic community often mirror those of all Americans – jobs and the economy, education, and healthcare – polling consistently shows that the Hispanic communities consider immigration reform a personal issue. By giving a second chance and reelecting a president who did not deliver on a past promise to enact immigration reform, this demographic now expects to have one of its main policy issues addressed and will most definitely hold him and other elected officials accountable. Furthermore, past US Presidents have often waited until their second term, if they were so lucky, to tackle immigration reform. That time is now upon President Obama and us. In their second term, Presidents often look to cement their legacies. Supporting and signing a bill that truly reforms the United States’ immigration system would be quite the feather in President Obama’s cap. The election results in November also taught the man Obama defeated—Mitt Romney, his party, and his supporters—a valuable lesson: they need to reexamine their current approach or listen to those in their own contingent who have been advocating for immigration reform over the past few years. The GOP, its elected officials and its strategists are not naive enough to believe that supporting immigration reform will be a cure-all for their declining support among the Hispanic communities and other minority communities in the recent years. They also recognize that the rhetoric and tone with which they approach key issues can greatly be improved. Some notable conservatives, like rising GOP star Senator Marco Rubio, are leading the charge to make the Republican Party the “pro-legal immigration party” instead of the “anti-illegal immigration party.” This re-branding is a small part of a concerted effort to frame the immigration discussion within the ongoing debate over economic policy. Conservatives are taking aim at the bureaucratic mess that is the US Citizenship and Immigration Services, looking to improve border security, and boost economic growth. The results of the presidential and senate races are strong motivation for those who have finally realized that if current electoral trends persist they will continue to lose influence at the national level. This has led to increased bipartisan efforts on many policy issues, including a total package proposal for immigration reform, and thus should produce a very healthy debate. Eight Senators, including Democrats and Republicans, put forth a plan from which they will construct a package of legislation. Members of the US House of Representatives are also working together on their own proposal. President Obama has laid out his vision for reforming our immigration system, but the White House will not introduce its own legislation at this time. The President is hoping that the US Congress can agree upon legislation. This is a promising sign in the long process of legislative reform, but there are still other reasons to remain optimistic. For the first time we are seeing past adversaries come together to bridge the gaps that have stopped past legislation like the DREAM Act from passing. For example, business leaders are working together – the US Chamber of Commerce and labor unions are starting to collaborate to bridge certain gaps. Religious leaders, including the Christian Right, are also entering the debate. The DREAMers have made their voice heard and will be part of the ongoing debate. Educators, community leaders, and employers are also offering their two cents. There is space for all of those who want their voices heard at the table and all are optimistic that they can complete this heavy lift. We will see many different plans emerge over the coming months, and I believe this to be a positive thing. It shows that immigration reform is being taken seriously. The Hispanic voting community, called a “sleeping giant” for the past couple of election cycles, has woken up and so have other immigrant communities. These communities and other activists have realized they must do more than just cast a ballot. They must hold elected officials accountable. Over the past few years we have seen the impact that grassroots movements can have on legislation proposed by both sides of the aisle. Immigration reform is an overarching economic policy issue that also has some very important social and human rights implications. This is bringing Americans of all sorts to the bargaining table. Friends, the debate is occurring across the country and has finally arrived in the legislative center, the nation’s capital. Elected officials are taking this opportunity to show leadership, but they need our help. We have a chance to correct past errors, reform stove-piped bureaucracy, bring the undocumented out of the shadows, welcome the world’s best and brightest with open arms to create a brighter future for this country, our children, and those who wish to come live in and contribute to a more prosperous United States. The time is now, and the legislators in Washington, DC are very much aware of this unique opportunity. Contributed by Max Ivan Rava, an affiliate of the Inter-Faith Committee on Latin America, Latin Americanist, and policy analyst. On January 28, the Bipartisan Framework for Comprehensive Immigration Reform (Senators Schumer, McCain, Durbin, Graham, Menendez, Rubio, Bennet, and Flake) presented their principles for new legislation[i]. While I whole-heartedly support Comprehensive Immigration Reform, I am very concerned about the prospect of more militarization on the border. Drones are an expensive and dangerous (they can be armed) means of surveillance of the US-Mexico border. There are currently 6 drones and 124 planes present on the border. How much more enforcement do we need? The effects of current US economic and military policies around the world need to be addressed for true comprehensive immigration reform. The Free Trade Agreements, Extractive Industries and large scale Development projects have impoverished and displaced many families in Latin America. 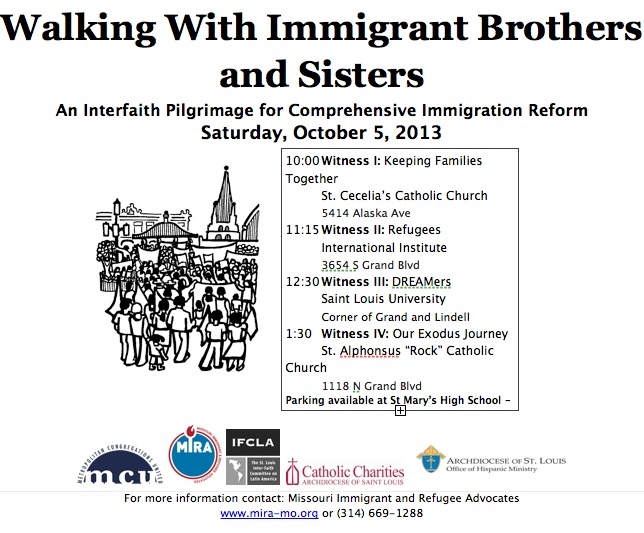 The push and pull factors are as important as the status of the undocumented sisters and brothers among us. One reality will not be resolved without dealing with the other. The response of the Obama administration has been enforcement with an emphasis on deportation. More people have been deported (cost $12,500/per person/per deportation) in six years than all who were deported before 1997[ii]. Go here to see a running count of how many people are being deported under President Obama. Once again police and military training and assistance for Latin American countries bring unnecessary force as small farmers resist land takeovers and mega projects by large corporate interests. Under the guise of the “Drug War” and “Anti-terrorism” security forces are growing in size and scope. We remember how this played out thirty years ago: repression, low-intensity war, death squads, and thousands fleeing for safety. One of our IFCLA partners, the Alliance for Global Justice, has put together a Border Militarization Study Guide. I am going to follow the classes, perhaps you will too. Click here to watch this short, informative video of a visit to the border by the Alliance for Global Justice Board of Directors to learn about the impacts of border militarization. [ii] “Mapping the Shift from Border to Interior Enforcement of Immigration Laws during the Obama Presidency.” Social Scientists on Immigration Policy, Jan. 25, 2013.